In 2014. the nominal GDP of French Polynesia accounted for 5.623bn dollars, making it the 6th largest economy in Oceania after Australia, New Zealand, Hawaii, New Caledonia and Papua New Guinea. The main economic sectors of the country are: agriculture (3.1% of the GDP), industry (19%) and services (including tourism, 76.9%). Tourism is an important sector as it employs about 80% of the labor force. The major agricultural crops include coconuts, vanilla, coffee, fruits and vegetables, dairy products, poultry, beef and fish. There is also a small manufacturing sector, the most important manufactured goods being coconut oil and other oils, traditional handicrafts, printed cloth and beer. Other industries include pearl farming, handicrafts, phosphates and boat building. The fishing sector is also developed, as shrimp and oysters are farmed. 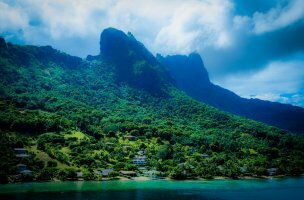 It should be mentioned that French Polynesia's seafloor contains rich deposits of copper, nickel, manganese and cobalt. These natural resources represent a potential source of revenue for the country. French Polynesia is the world's 175th largest exporter. French Polynesia exports high quality vanilla, noni juice and famous black Tahitian pearls. Other exports include coconut products, mother-of-pearl, perfumes, shark meat, planes, fish and jams. The country's main exports partners are Hong Kong, France, Japan, US and Italy. French Polynesia was once an agriculture-based economy, but since France placed research personnel in the region, the country's economy has changed its main activities to investigations and tourism. Tourism represents about 25% of the French Polynesia's GDP and it is one of the main sources of the country's revenue. The country's narrow economic base makes it dependent on imports for many of its basic goods. It should be noticed that French Polynesia has a moderately developed economy, which is sustained by imported products, tourism and financial assistance of the metropolitan France. French Polynesia is the world's 168th largest importer, its main imports being consumer goods, food products, building materials, fuels, cars, various equipment, pharmaceuticals. The country's top import partners are France, Singapore, China, US and New Zealand. 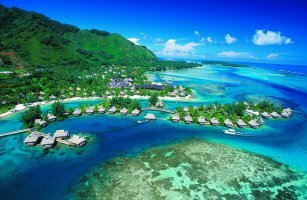 French Polynesia is an overseas collectivity of the French Republic situated in the South Pacific Ocean. The country is divided into 5 groups of islands: The Society Islands, the Tuamotu Archipelago, the Gambier Islands, the Marquesas Islands and the Austral Islands. French Polynesia is a member of the International Trade Union Confederation, Pacific Islands Forum (associate member) and other international organizations. Products coming from the European Union are exempted from duties. For other countries duties are calculated on the CIF value of products. Customs duties vary according to the nature of imported goods, which are subject to Customs classification. There is also a number of imported products exempted from customs duties. French Polynesia applies a normal VAT of 9% on the majority of imported goods, an intermediate VAT of 6% on services and a reduced VAT of 3% on essential foodstuffs and hotel industry. In order to preserve French Polynesia's unique and fragile environment, the authorities impose strict controls and restrictions on the importation of products that may present a phytosanitary or zoosanitary risk. If you are importing one or more restricted items, you should have all the necessary sanitary documents (import licence, phytosanitary or veterinary health certificate).